Midland IRA is a self-directed IRA administrator that gives clients the option to invest in an array of alternative assets within a tax-sheltered account. The company is not a fiduciary so in an effort for investors to meet one another Midland IRA is holding a speed networking event on Thursday, May 26 at 3:00 in Fort Myers. Midland IRA would like to play matchmaker. The self-directed IRA administrator does not refer clients to other companies or clients to other investors which is why the company holds networking events to bring clients and businesses together. Instead of speed dating Midland IRA has organized speed networking. 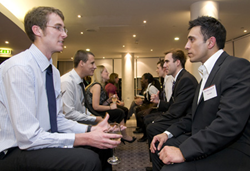 Speed networking is the same concept as speed dating where individuals get a few minutes to meet each blind date in the room. Rather than meeting blind dates, participants will get the chance to network with every potential business relationship in attendance. “Networking events can sometimes be uncomfortable,” says Dave Owens, President and CEO of Midland IRA. “Speed networking takes some of the pressure out of it because you’re introduced to every person at the event.” Participants are encouraged to bring a lot of business cards as well as any informational material to be passed out to attendees. Midland IRA is a self-directed IRA administrator that provides tax-deferred and tax-free investment opportunities, superior customer service, and educational tools to assist investors in realizing the maximum benefits possible within IRAs. Midland IRA makes it easy to use self-directed retirement plans to invest in assets that the individual investor knows, understands, and can control. Midland IRA is also a 1031 exchange qualified intermediary. To learn more, visit www(dot)MidlandIRA(dot)com. Dave Owens is president of Midland IRA in Fort Myers, Chicago, Miami, Gainesville, New England, and the Florida Panhandle. Owens opened the Fort Myers headquarters in 2003. His background as a certified public accountant, combined with a long history of personal retirement self-direction, provides his audiences and clients with solid advice and practical solutions to their IRA investment questions. Dave holds a BS in accounting from Purdue University. He also earned the prestigious Certified Exchange Specialist designation through the Federation of Exchange Accommodators.